How many Hepatitis-C deaths does it take to make a billion dollars for a drug company? HomeNews & EventsHow many Hepatitis-C deaths does it take to make a billion dollars for a drug company? Shareholders of American pharmaceutical giant Gilead are meeting in California today to review the work and profits of the company. We’ve done some of the maths for them: Every 79 seconds someone in the world dies of Hepatitis C (HEP C). And in that same amount of time, Gilead makes $26,068 from selling drugs, including the cure for HEP C.
In late 2013, Gilead launched Sofosbuvir – a new wonder drug that cures almost all cases of HEP C. That means that we could make some big steps towards eradicating the disease, which globally affects more than 71 million people and kills close to 400,000 people a year. An estimated 2.3 million people living with HIV are co-infected with hepatitis C virus (HCV) globally. Sofosbuvir has provided a new lifeline for millions of people. But there’s one problem. Gilead has set prices so high that only a small fraction of people can afford it. In the UK, the NHS has had to ration the use of Sofosbuvir because of costs and can currently only treat less than 1 in 20 patients. And the situation is even more bleak in many poor and middle-income countries. The cost price of producing it is as low as a couple hundred pounds, but the NHS is currently paying up to £78,000. So why is this drug so expensive? 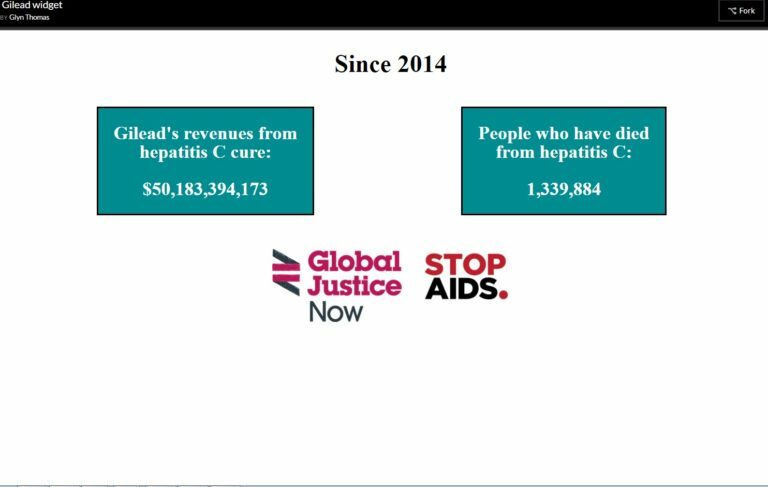 Thanks to global patent laws, Gilead has a 20-year monopoly on the drug and can charge what they want, holding HEP C patients as hostages in order to rake in tens of billions of dollars in revenues. Patent laws are supposed to help incentivise research and development by ensuring profits for new drugs. But Gilead did not invent Sofosbuvir. The research for the drug was partly funded by American tax-payers and the investment that Gilead made in buying the rights for the drug was more than made back in their first years of its sale. So most of the money you pay for the drug now goes to marketing and to paying dividends to the shareholders gathering in California right now. The anger around Gilead’s greed has led to activists taking action across the world as well as in the UK. 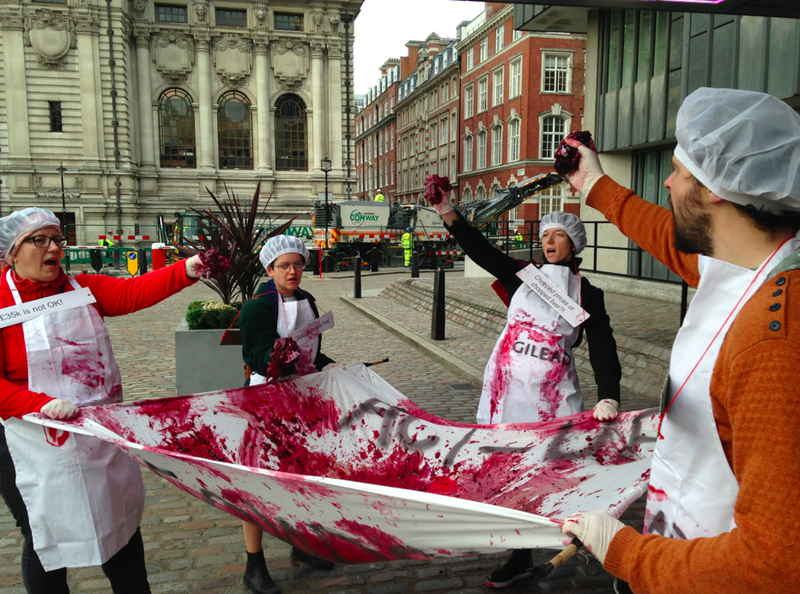 Below ACT UP London dress as Gilead butchers, demanding that they drop the price of Sofosbuvir, and strip naked in Gilead’s office, demonstrating the vulnerability of patients to Gilead’s pharma greed. The case of Gilead and Sofosbuvir is far from unique. Across the world, hundreds of millions of people are priced out of accessing the medicines they need by big pharmaceutical companies with monopolies over essential medicines. It’s estimated that ten million people across the global south died from AIDS-related diseases while big drug companies tried to block the production of ‘generic’ versions of drugs that could be used to cheaply treat patients. In the UK the annual NHS drug spending has gone up by £3.8 billion in the last 5 years and the NHS increasingly has to reject or ration new drugs because of their costs, leaving patients without access to new treatments. It’s high time for policy makers to realise that the current system isn’t working for people here in the UK and around the world. We clearly can’t trust giant companies with our health so why are we handing them control over essential medicines when most innovative research is funded by us in the first place? * A breakdown of our calculations can be found here.